It’s the Country’s Family Reunion TRIBUTE Collection! 12 DVDs with almost 12 hours of content and over 130 live performances! For the past several months, we’ve been airing Tribute shows on RFD TV of legendary artists who’ve joined us for Country’s Family Reunion and Larry’s Country Diner. But did you know you’re only seeing a small portion of each Tribute episode? Well, this CFR Tribute Collection has so much more you haven’t seen! Who knew so many great artists would want to come out to our tapings… again and again? And because so many artists have appeared on so many of our series, we realized you’d have to buy over 14 different full collections to see everything your favorite star has done! So, each Tribute volume pulls the best moments from over 17 years of taping to focus on one particular artist! 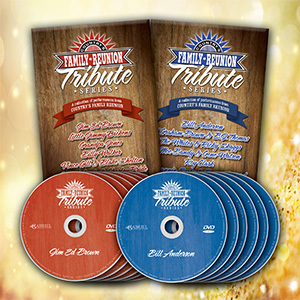 You’ll see tribute volumes dedicated to Roy Clark, Jeannie Seely, Jean Shepard, Gene Watson, Moe Bandy, Vince Gill, Blake Shelton, Charley Pride, Crystal Gayle, The Whites, Ricky Skaggs, Grandpa Jones, Little Jimmy Dickens, Jim Ed Brown, Billy Walker, Bill Anderson, T. Graham Brown, BJ Thomas and others. Again, we can only fit so much content onto a TV episode, so there’s approximately 4.5 hours of extra content on this series never before aired on TV! If you bought each of these volumes separately, you’d spend well over $200 dollars, but this great Tribute Collection is just $29.95. That’s right! Just $29.95 to get all 18 artists, each celebrated on their own volumes. Remember, the shows you’ve been watching on TV are only a small portion of the entire Tribute Collection— And there’s 4 1?2 hours of extra content we didn’t have enough time to air on RFD! !